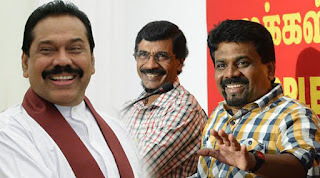 Leader of the Opposition Mahinda Rajapaksa has issued a clarification on the matters pertaining to the discussion scheduled to be held with members of the Janatha Vimukthi Peramuna (JVP). The statement issued by his office said that a meeting was held yesterday evening with the party leaders of the Joint Opposition and the matter regarding the discussion scheduled to be held today with the JVP was also taken up. “The Leader of the Opposition stated that it is his duty and responsibility to conduct discussions with any party in the Opposition as the Leader of the Opposition,” it said. He also stated that the proposed discussion is to be held today as per the request made by the Janatha Vimukthi Peramuna and if any group in the opposition including the TNA requests for a meeting to discuss any matter important to the country that he expects to discuss with them. The Leader of the Opposition further informed that Leader of the Mahajana Eksath Peramuna (MEP) MP Dinesh Gunawardena, and MP Dullas Alahapperuma will also participate in this discussion.